What We Mean When We Say We Are "Carbon Neutral"
Our apartment management tasks, facilities, and maintenance require energy and produce emissions which directly or indirectly generate carbon dioxide, which leads to global warming. From heating and lighting public spaces, mowing the lawn, blowing leaves, and car travel time, we figure we cause about 23 tons a year of carbon dioxide to be released into the atmosphere. 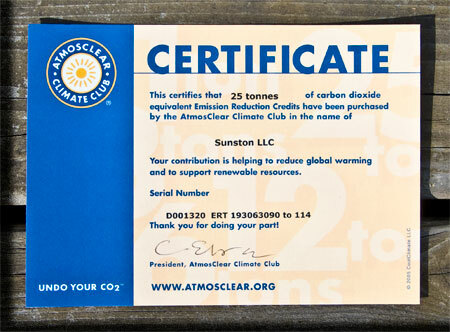 To make up for that, we have purchased 25 tons carbon offsets from a company called Atmosclear.org. Atmosclear uses the money they get from people like us to reduce greenhouse gas emissions from the Des Plaines landfill. They are audited, and our 25 tons is recorded so they can't resell it to anyone else. Atmosclear is one of four companies the Environmental Defense Fund chose to link to on their Fight Global Warming website. They say they did both a scientific and accounting review of Atmosclear's practices. Our Company, Sunston LLC, manages and owns Macleay Associates LLC, Jake Associates LLC, West Associates LLC and Skystone LLC. Sunston, LLC purchased the 25 ton offset from atmosclear to neutralize the carbon activities of the four subsidiaries as well as the activities of Sunston itself. Check out the Fight Global Warming website for more info on trustworthy companies who sell carbon offsets. Be careful. There are a lot of ripoffs out there. Some companies have dubious methods of offsetting carbon. Some resell the same offset to many people. Others simply charge ten times the market price.